Without fail the last two weeks of every year can be called the most anti-personal-and/or-work-related productivity period of the year. At least nothing of any importance gets done towards your personal and/or professional goals. Clients don’t respond. Producers go on vacation. It snows. Your in-laws stay at your house. You don’t want to workout because you’re waiting for January 1st. You are overburdened with last minute shopping and wrapping presents after one too many drinks. I have a feeling that you’d rather use these two weeks to get something big finished instead. Maybe it’s something that’s been bugging you all year that you just didn’t get around to. Did you want to edit a family vacation video? Or write a short book? Start a website? Deep clean the garage? Why are we going to wait any longer to do these things when the opportunity is right in front of us? I have a challenge for you. 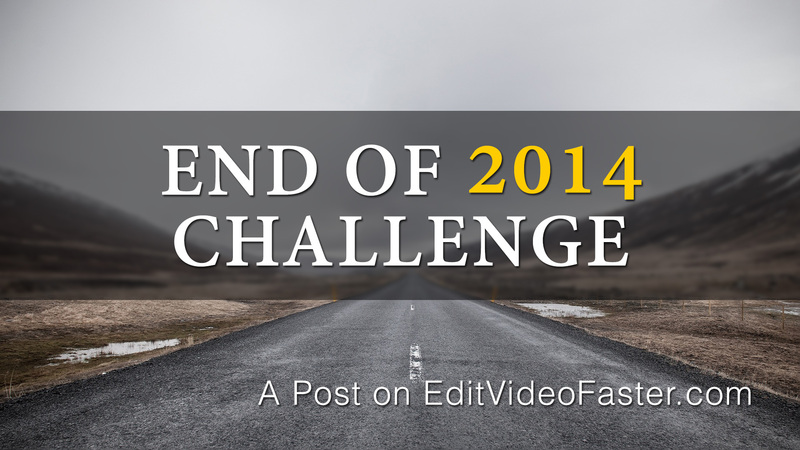 Let’s call it the End of 2014 Challenge. Together let’s take the next two weeks and complete one of these projects. We don’t need to wait until 2015. We can go out of 2014 with our guns blazing. Here’s the deal though. In order to get something like this done we need more than a deadline. We also need social accountability and a consequence if we don’t get it done. Our deadline to complete our project obviously is December 31st, 2014 at 11:59pm. To be socially accountable leave what you are going to do in the comments section here. Tell a friend(s) or a family member(s) that you are going to do this and you want them to make sure you do it. Lastly you can email me at josh [at] editvideofaster dot com and I’ll bug you about your project and keep you on track. More on that in a minute. Come up with a consequence if you don’t finish your project. Make it something that’ll hurt a bit. Maybe that’s $100 donation to a rival university (that’s what I’m going to do). Alright, I’m excited! I want to tell you what project I’m going to be working on. All year long I’ve started various Video Editor Survival Guides, or VESGs for short. I’m yet to finish one. 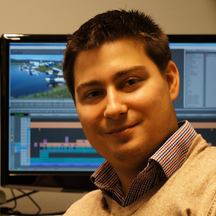 They are on all sorts of different aspects of the video world (dealing with clients, finding gigs, various tools/FX in Media Composer, etc.). Right now I have a rough outline of a VESG for Avid Media Composer’s Timeline. It’ll guide you through virtually anything you’d want to know about the Timeline. I want to finish it. I want to write it and create an eBook/PDF of it. If I don’t finish it I’m going to donate $100 to George Mason University’s Film and Video Studies program. GMU’s program is a regional competitor to James Madison University’s program, my alma mater. Oh, and if finishing a project you’ve been wanting to finish all year isn’t enough for you then if you participate and complete the End of 2014 Challenge then you get a copy of my VESG for free before it goes on sale. All you have to do is email me at the address above (or you can use the contact form) with the subject “End of 2014 Challenge” before December 25th. Let me know what your project is and I’ll bug you every few days about your progress. You can ask me for advice if you want – I’ll help the best I can. Once you finish your project just send me a picture or some sort of proof that you finished it before the deadline. And hope that I finish my project in time too! What do you think?? If you read down this far then I’m sure you want to do it. You might be a little scared of whatever consequence you choose but that’s why you’re going to finish your project. In the next two weeks you’re going to get something done that’s going to be a huge mental win and put yourself in the right frame of mind to tackle 2015. Let’s go already! Every minute that passes is one minute closer to our deadline! We’re in this together. To recap, write what your project is in the comments below. Shoot me an email before December 25th if you want me to push you to complete your project and to be eligible to get my Video Editor Survival Guide on Avid Media Composer’s Timeline free and before it’s released to the public. Lastly, tell others! The more friends we have to participate the more likely we are going to get our projects done. I can’t wait to see what you’re going to do with the last two weeks of 2014! I can’t wait to write my first VESG! Finishing up the rough assembly of a horror feature that wrapped last week called Bite. I committed myself to finishing a complete, rough edit of the film before the holidays. Good luck, Nick! Let me know how it turns out.